Just the other day I asked for some input about how we should use our United Airline credits. We decided to go ahead and buy the tickets to take a long weekend vacation away to San Francisco, California instead of using the credits towards our Roatan ticket purchases. It was just a much better decision all around since American Airlines could give us much better flight options for Roatan. We just have to pay more but I think it will be much better in the long run. I’m really looking forward to going to San Francisco. We came up with some mini vacation ideas for the short time we’ll be there. We are planning on doing the Alcatraz tour at night and I would like to see the Golden Gate Bridge and hang out at Fisherman’s Wharf and Pier 39 to see the sea lions. I would also like to take a quick ride in a cable car and see the beautiful Painted Ladies. The Japanese Tea Garden sounds like fun too. We’ll need to rent a car! And find a hotel in San Francisco. We’ll make our way to Carmel and Monterey for a couple days via Highway 1, one of the top scenic drives in California. And maybe even drive to the Sacramento area. In Carmel/Monterey I think we are going to stay in a bed and breakfast or hopefully find a beautiful hotel on/near the beach. I hear the sunsets are pretty amazing there. We also plan to go on a whale watching tour. We won’t have much time on this trip (4.5 days) so we don’t want to overbook and stress ourselves out. We also need to watch the funds since we will be going on a bigger vacation later this year. We have the main activities decided and then we’ll play it by ear! 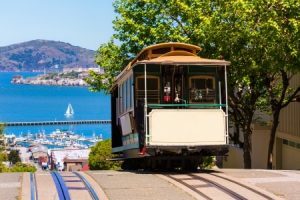 Have you ever been to San Francisco/Carmel/Monterey? Do you have any suggestions on where to visit, stay, eat, etc.? I’m so excited to see that you’ll be heading down to the Carmel/Monterey area soon. As a representative from SeeMonterey.com, I have a few recommendations for you! For sunsets, I would recommend going to Carmel Beach to have a sunset beach bonfire. Make sure you make your bonfire plot south on 10th Ave on Scenic (you’ll understand more when you get here). Watch all of the doggies run freely on the beach as Carmel was recently voted the most dog-friendly town in the US. For whale watching, sign up for a fast raft tour to take you from Monterey to Point Lobos just south of Carmel. The Fast Raft has room for only six people, which makes for a very informative, up-close and personal experience. Don’t miss out on the new Tentacles Exhibit at the Monterey Bay Aquarium. This unique and interactive experience will give you all the information you’ll ever need to know on octopuses, squid and cuttlefishes. There are still the standard must-sees including the sea otters, kelp forest, penguins and the outer bay wing. We are excited too! Thanks so much for the awesome suggestions, Jessica. You rock! I would love to visit the aquarium, hopefully we can make time for that. Angie, I loved Jessica’s tip to see the Monterey Bay Aquarium. I loved it there!!! Might have to add that to our to-do list then. Will chat with Kev about it. We go to San Francisco each year and stay in Chinatown at the SW Hotel. It’s comfortable and I love the location. There are bus stops all around, the tram stops up the hill and I love the vibe. Have fun! Awesome! Thanks so much for the suggestions. We are really looking forward to it. Great tips Corinne! China Town is an experience in itself, very interesting and fun. Thanks for the feedback on Chinatown. I really think we are going to have to go back since I keep hearing about these great things to do.